Whenever your hero attacks, restore 2 Health to it. If only it healed after attacking... Well, the way it is now is better if you are at very low health, but attacking at 30 hp and wasting the heal is more common. Bad weapon. This breaks before a Spoon does. This can not be compared to warrior's Fiery War Axe AND this should heal you after your hero attacks instead of before your hero attacks so you don't waste your 2 health early game! One of the best weapons. imo. Its a good control tool OH and the fact explosive trap dosent kill you at 1 HP with this when you hit face. "Hunter player ": THIS WEAPON IS GLITCHED IT LET PALACHEATER LIVE! This card, for 4 mana, a very reasonable costs, gives you 4 unique benefits. Not only can you utilize the card to attack twice, it also heals you twice. 2 health doesn't seem like a lot, but it's actually exceptional. It assures anything you hit with two attack or less is no net loss to your health, anything you hit with 3, 4, or 5 attack gives you a nominal loss, and that anything you hit between say 6-8 attack does damage to you, but a "normal" amount of damage you'd expect attacking a creature. The card's only counters are Harrison (a utility legendary that is a counter, but not a brutal counter, you could literally play your other Truesilver to take care of it) and Acidic Ooze, both of which, given the mana which you can play this card for, will speak for a majority of the mana of your opponent's next turn. Plus, he can't play them on your turn. You've already gotten your 2 unique benefits out of this card if you attack the turn you play it. This card, for 4 mana, a very reasonable costs, gives you 4 unique benefits. Not only can you utilize the card to attack twice, it also heals you twice. But you're not explaining why it's better than other weapons. By this logic, Sword of Justice provides 5 benefits, which for 3 mana would make it better than Truesilver. But we know that's not true. And before you say anything, you don't need to prove to me why it's better- I'm just saying your logic is shaky at best. Arguably the best weapon in game. If not the best basic weapon. I feel like this is more balanced than Fiery War Axe, since it can't come out until turn 4. Good without being crazy OP. The heal is virtually irrelevant for a class with as many heals as Paladin (especially now that everyone and their mom is running Healgod). Best weapon in the game. 6 point swing, while only taking 2 total HP off the board. 12 points over 2 attacks, Well Played. The card is so good that you'll almost never see paladin decks without it and it carries hard in arena. 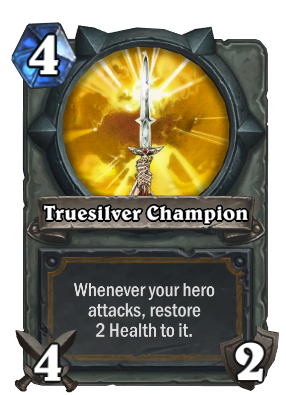 Truesilver Champion x 2 are a reward for raising a paladin to level 2.